Breakfast Club Poker: So Proud of Carl Olson! So Proud of Carl Olson! I'm staying in what we have been calling the House of Cards, long befor the other House of Cards had their name. It's a large Spanish style house rented by a handful of online poker pros who've come to Las Vegas to take their shot at the World Series. We're living the life -- pool, golf course, ping pong room, jacuzzi, entertainment room, bar with pool table, etc. 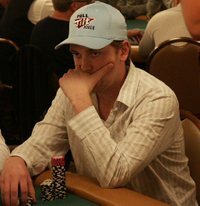 The other day everybody but John played in the $2,000 NL Hold'Em event. Carl Olson is still in it. The Blonde Ivey is hanging in there. He's my new fave underdog, and even more interesting because he's only 24, has some big cashes in the past two seasons of the EPT, and is headed to Europe again this fall. Travel, poker, ahhhh. The $2,000 is down to 45 players and they just went on dinner break. Carl wanted to keep playing, but the break is, of course, mandatory. "It's been a rocky day. I just doubled up and am in reasonable shape now. But I'm still below average," said Olson at $70,000. Dan Harrington is also at his table with a little bit less.